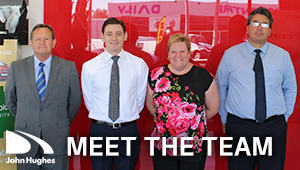 WA's most trusted car dealer is proud to offer the full Kia range with Australia's best warranty, 7 years and unlimited km's. John Hughes is your Kia buying destination. We have most models available for immediate test drive and delivery including the Sportage, Sorento, Rio and the newly released Kia Stinger. We are dedicated to providing you the best possible customer service from the showroom floor to our service centres. Do we refuse to be beaten on any Kia deal? Absolutely!